Starring: Leonardo DiCaprio (Romeo & Juliet), Joel Edgerton (Warrior), Tobey Maguire (Seabiscuit), Carey Mulligan (An Education) and more. “I’m certainly glad to see you again.” -I imagine that’s what many fans of the F. Scott Fitzgerald book have to say to this latest adaptation of the well-known novel that has been a textbook read in numerous school English classes over the years. Having never read the book myself, I am told that Luhrmann’s film adheres pretty closely to the source, with, of course some liberties (namely even an slightly altered ending), thus leaving something for even Gatsby experts to be pleasantly (?) surprised by. Impressive in overall style, Luhrmann’s visually and musically stunning tribute to writers, playwrights, the “Roaring 20’s” and its ideals, unfortunatly, lacks when it comes to overall substance. Hit the jump to read more. 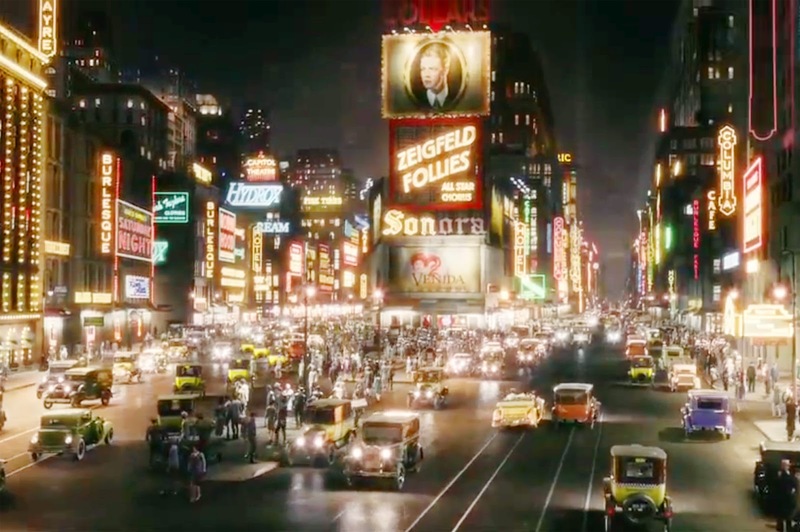 Beginning with the narration of Gatsby’s tale via Tobey Maguire’s Nick Carraway, The Great Gatsby plays out on screen exactly as I’d imagine the book to. The excellent performances by the entire cast make the characters come to life in a fashion that almost makes one forget who the actors are playing them and believe them to truly be the characters they portray. (I did say “almost” as something about Leonardo DiCaprio and Tobey Maguire both still had me thinking that I had seen their characters before in another movie…say…Titanic or Romeo & Juliet or Spider-Man, etc -a minimal complaint). Along with the fun music and mostly great visuals (there were moments in which the CGI background made the actors appear as if they were simply on a stage with a painted backdrop instead of actually on location), however, it is the cast that really ties this all together. DiCaprio plays the victim of love, if you will, quite well. He should…he’s done it numerous times (for Luhrmann in Romeo & Juliet, for Cameron in Titanic, for Nolan in Inception, for Scorsese in Aviator or Shutter Island). To say that he isn’t proficient in his part would be as incorrect as saying he has shown a great amount of range in his characters over the years (with a few exceptions). Still, DiCaprio doesn’t detract at all. He makes the character his own, as do all the additional castmembers (including Joel Edgerton, Isla Fisher, Jason Clarke, Elizabeth Debicki and more). The story tends to move at a rather slower pace, especially in the first half, and, while that may be appropriate for words on a page, it only comes across as a bit tedious and redundant onscreen. 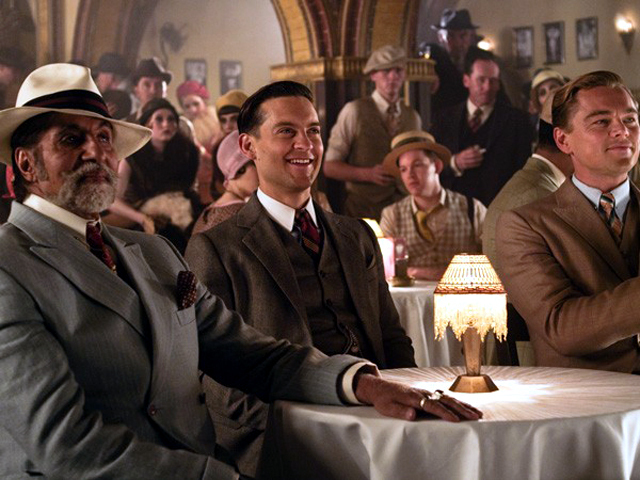 The Great Gatsby is good…full of glitz and glamour…just not as great and grandiose all around as desired. Next Movie News Monday for May 13, 2013. That’s what I am afraid of this movie, there’s too much hype around and perhaps it’s what made the movie not as expected. Good thing the cast and music worked good. Thank you for reading! This film was pretty, but I think what I’ve heard from fans of the book may still continue to be true…none of the movie adaptations stand up the level of the book. This seems to be a universal truth. thank you for the comment. I hope you still enjoy the movie when you see it. Good review T. Visually, it is quite interesting, but I wish there was more of a pop to the story and the characters. Just didn’t quite feel it. Thanks Dan the Man! I had hoped for more, myself. Great review T. Been looking forward to this so I’m a little disappointed with some of the scores but I haven’t read the book so at least I won’t be comparing it to that. yes, well, at least you wont have highest expectations now going into it and may enjoy it more. I look forward to your thoughts. sadly. and now I’m hungry thanks to your comment!!! It’s apparently a difficult story to adapt, for some reason. Read the other day that out of all the adaptations, none are highly regarded. none are highly regarded? wow. well, I think I’ll just have to give the book a shot. That’s what the article I was reading said anyway. I came away liking the movie a lot. I really haven’t watched a lot of DiCaprio’s movies, but I think he was an excellent Gatsby. He perfectly showed Gatsby’s cool venire is in fact very thin. Gatsby has been trained to say the right thing, but you see it in his eyes, body language and his little ticks, that he is not so cool. DiCaprio portrayed it perfectly. In fact all of the actors should be commended. One thing about the character development I did not like was I dont think they developed Jordan enough. She was kind of window dressing in this. She had a bigger role in the book. As for the art style, I love the period, and I think they did an excellent job with it. Its kind of like looking at the past through rose colored glasses. 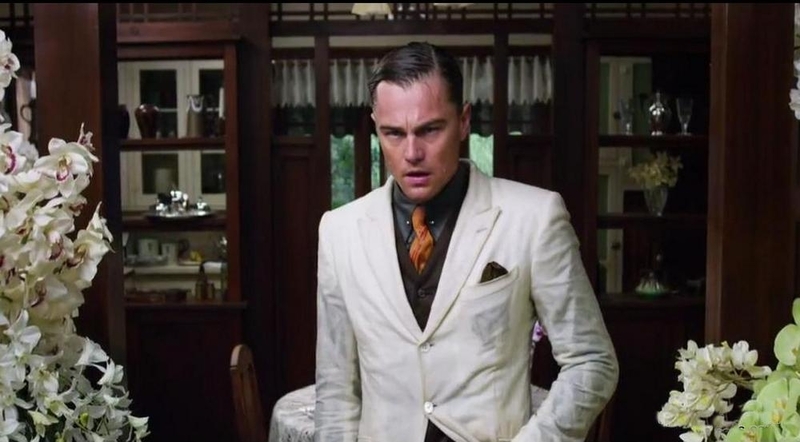 Which I think is layering Gatsby’s own wanting to repeat the past and Caraways naiveté. I was worried about the soundtrack; I love Jay-Z, I love New Orleans Jazz, but I didn’t think they would mix so well. The 1920’s and the double oughts we just lived through have a lot in common. And the music of both show a more care free, excess driven mentality. They were blended well together. The liberties taken with the book were not excessive in my eyes. I think they made parallels to Fitzgerald’s own life. And at 2.5 hours, I think they did an excellent job of getting all the pertinent parts of the book in. I dont think any movie will ever capture the essence of a book, they are two different ways to experience a story, and I think its a testimony to the book that no one can perfectly emulate what Fitzgerald is trying to say. I would easily give the movie a 9/10. P.S. I really wish we, as a society, dressed like that. Im tired of seeing pajamas in places of business! thank you for the spoiler warning! Knowing that you recently finished the book I am glad to see that you liked the movie a lot. Many people have criticized DiCaprio’s Gatsby yet you call him perfect in the role. Good to know. I felt that Jordan was lacking too and am happy to hear she has a bigger part in the book. Isn’t neat how the music tended to really add to the film even though it isn’t from the time period? I was surprised, pleasantly. 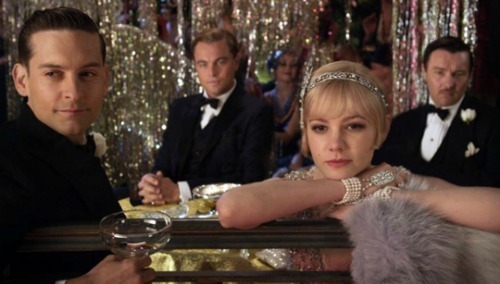 ‘The Great Gatsby’ appears to be glitzy, opulent eye candy in the extreme. Though in characters, plot, soundtrack and overall story. The film is a mile wide and half an inch deep. Hi T, I ended up giving it a slightly better rating than you but essentially we agree that there’s too much visual feast, but left our soul hungry. It’s interesting that even though Baz is happily married (at least I think he is), he has such a penchant for tragic stories of forbidden love. But then again, as far as forbidden love goes, this one lacks bite. Especially compared to Moulin Rouge!’s Christian and Satine. Totally agree with your review of the film. 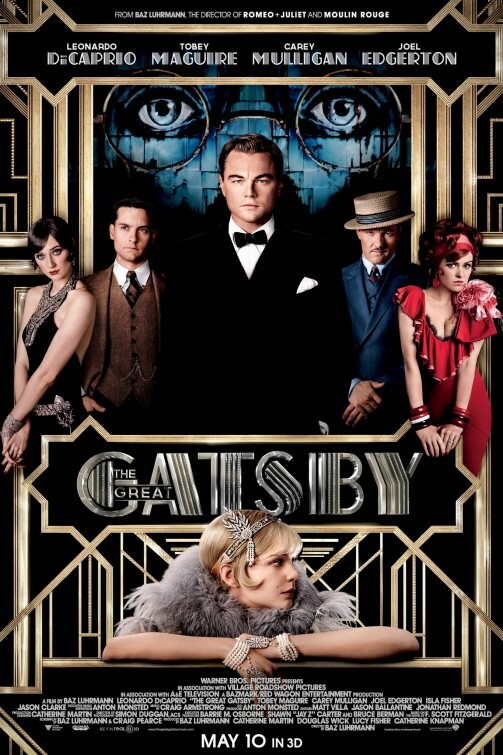 I think the movie was visually stunning (especially the party in Gatsby’s house) and would have been worth watching in 3D. However, outside of Gatsby himself, the characters seemed to lack depth… even more so when considering the film is an adaptation of a book. Ultimately I felt Gatsby was worth seeing but not watching. I like how you phrased that: “worth seeing, but not watching”. I think I will have to read the book now. Oh fun. that sounds exciting. the Electric Cinema looks AMAZING. I’m jealous. have a wonderful time. I can tell you that it was a stunning cinema and if I ever was adventurous I’d open a cinema like that myself (maybe if I ever win the lottery ;)) The movie itself? I thought it was very disappointing. I think you summed it up nicely, Nostra. I was surprised how much the music did not detract from it either…even though it was more modern. What did you think?